Drakeley Pool Company, LLC is an award-winning luxury swimming pool, spa, and water feature design and construction firm. A respected industry leader, Drakeley Pool Company’s portfolio is broad, featuring custom high-end projects executed for both residential and commercial clients. Many projects have been recognized in publications such as Architectural Digest, Better Homes and Gardens, Green Home, Luxury Homes Quarterly, Luxury Pools, and Shotcrete Magazine. Aqua Pool & Patio, Inc., custom pool builder is a second generation, family owned and operated Connecticut pool contractor. For more than 40 years, Aqua Pool has been a leader in Gunite in-ground pool and spa design and construction. We take great pride in every phase of our pool design, pool and patio construction, fencing and pool landscaping projects. Our business is built on customer service, attention to detail and integrity while providing our customers with the swimming pool of their dreams. Aqua Pool provides complete and distinctive outdoor living area transformations. We have been enhancing the value of finer homes throughout Connecticut, western New England and eastern New York for over 40 years. As a custom pool builder, Aqua Pool also offers reliable pool service and pool maintenance, pool renovations and pool equipment and systems upgrades. For your peace of mind we even offer vacation pool sitting! 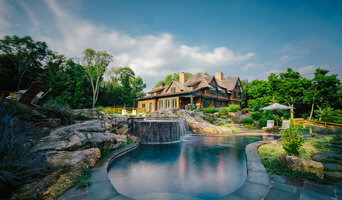 Dobson Pools, LLC is a family owned and operated in-ground gunite pool design, construction and service company located in Northwestern Connecticut. In business since 1968, Dobson specializes in custom residential gunite pool and spa configurations, and has fashioned thousands of sophisticated, original pool designs for prestigious properties throughout New England and beyond. 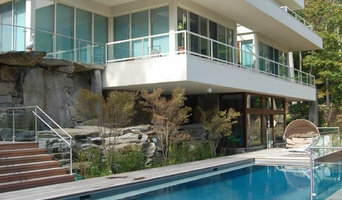 Custom design and building of in-ground gunite pools and spas, patios, pool houses and outdoor kitchens. Openings, Closings, weekly service. Renovation and repairs. We are about pools. We are about spas and waterfalls. But more importantly, we are about creating personal, emotional, and lasting experiences for our customers and their families. Rather than taking the standard approach of utilizing cookie-cutter designs, we create a custom concept with an integrated water shape, hardscape, and landscape design. This three-tier approach adds dimensions and possibilities usually beyond what our clients thought possible or even dreamt about. In sculpting your backyard, we consistently and dramatically develop and uncover the unique, hidden beauty that is your property. Gone are the days of thinking that your pool environment as strictly for "the kids", from Memorial Day to Labor Day. Our conceptual designs make it possible for our clients to experience and enjoy the sites and sounds of their pool-scape throughout the changing seasons. When it's dark, why go inside? Our custom underwater and landscape lighting will beckon you to extend your day. It's getting cool out, gather around the custom outdoor fire feature. Basic human instinct applied to your own unique and personalized environment. By looking beyond the obvious, we consistently deliver spectacular results. Where others see obstacles, we see inspiration. Whether it's a fantastic natural lagoon, or a classical linear design, our favorite customer comment is "I knew it would be nice, but I didn't know THIS nice!" Our passion is the driving force behind every project, from initial concept, to design, construction, and after care. We have the confidence, the commitment, the vision and the talent to see even the most challenging project through to its stunning conclusion. At Sharper Image Pool, we layout and design a pool to suit our customers needs, we do all of our own excavation and offer complete services including complete landscape restoration. We do not sub out any of our work. The owner has been in business since 1990 and knows how to best fit a swimming pool to your yard. We handle your transformation from start to finish. Along with the installation of your custom pool we also offer custom water falls, diving rocks, automatic covers, stone fire pits, masonry walls, masonry and concrete patios. We also can landscape the entire area to your personal taste. There is no need to hire additional contractors. Caratozzolo Stone Design "By Mimmo"
Creating Outdoor Living Enviroments for over 20 years. Custom Pool building, outdoor Grill Stations, Fireplaces, Patios. Landscape design Services or we can bid on one you provide for us. What exactly do Waterbury pool builders do? If you are planning for a new pool in Waterbury, CT, a swimming pool builder will analyze your outdoor space and your aesthetic wishes to determine an appropriate design for your yard, installing it once the plan is developed and approved. Once installed, some pool companies in Waterbury, CT can handle the necessary cleanings, water testing, renovations and equipment replacement or repairs for your pool or spa. If not, many can also suggest Waterbury, CT swimming pool contractors or maintenance services to help with upkeep or repairs down the road. Here are some related professionals and vendors to complement the work of swimming pool builders: Garden & Landscape Supplies, Landscape Architects & Landscape Designers, General Contractors, Landscape Contractors, Solar Energy Contractors. Before hiring a swimming pool construction company to create your new Waterbury, CT pool, determine how you'll be using it. Will it be for fun or for lap exercise? Will the primary users be children, adults or a mix of the two? Knowing the use can help you find Waterbury pool builders who shares your aesthetic. Once you find swimming pool builders in Waterbury, CT who share your style, research is critical. Review customer references and comments, collect at least three to four estimates to compare, meet with potential Waterbury pool designers and builders in person and ensure that they are Connecticut certified service professionals and licensed with the registrar of contractors before making any final decisions. In addition, get a sense whether they plan to complete the pool installation and be done with it, or whether they seem interested in building a long-term relationship with you. Be wary of the former: it's likely a reflection on the level of quality of the pool construction they do. Find a Waterbury pool contractor or designer on Houzz. Narrow your search in the Professionals section of the website to pool builders in Waterbury, CT. You can also look through Waterbury, CT photos by style to find a pool or spa you like, then contact the local pool company who designed it.